The City of Oakland Public Works Agency has received this issue. It is registered as service request # 491235. Please check back for status updates or contact us directly at (510) 615-5566. City of Oakland Public Works Agency referred this issue to CODE ENFORCEMENT, service request # 491235. Please contact that agency to follow-up. For more information, please visit the "Helpful Links to Other Resource Partners" at the link below. The City of Oakland Public Works Agency has received this issue. It is registered as service request # 493716. Thank you, in advance, for your patience as we work through a backlog of pothole service requests. Unfortunately the City does not have enough funding to repave all streets in poor condition. With limited funding, our response to resurfacing requests is limited to minor pavement and pothole repairs only. Our Street Maintenance Department will assess your street and determine whether temporary measures might be appropriate. Please understand that this work may be limited to pothole or other minor repairs, and that we have many similar requests. We will do our best to respond in a timely manner. The backlog of streets in Oakland needing pavement currently is $435 million and growing. The City of Oakland Public Works Agency has received this issue. It is registered as service request # 493677. Please check back for status updates or contact us directly at (510) 615-5566. City of Oakland Public Works Agency referred this issue to CODE ENFORCEMENT, service request # 493677. Please contact that agency to follow-up. For more information, please visit the "Helpful Links to Other Resource Partners" at the link below. The City of Oakland Public Works Agency has received this issue. It is registered as service request # 493679. Please check back for status updates or contact us directly at (510) 615-5566. City of Oakland Public Works Agency referred this issue to CODE ENFORCEMENT, service request # 493679. Please contact that agency to follow-up. For more information, please visit the "Helpful Links to Other Resource Partners" at the link below. Plenty o' dumping bottom of Jungle Hill on Santa Rita -- both sides of Santa Rita -- in the public roadway. The City of Oakland Public Works Agency has received this issue. It is registered as service request # 493371. Please check back for status updates or contact us directly at (510) 615-5566. Not sure why this is tagged "Pothole"; should be "Illegal Dumping". Sorry if my error, but note that Description says as much. Not sure what more info I can give. Also not sure why PWA seems so mystified. There is ALWAYS dumping at this site, and PWA has visited this site and collected it innumerable times. It should be on their speed-dial list. Practically the entire length of Santa Rita from Harrington to Ransom, esp. near the bottom of Jungle Hill, is a single, ongoing issue. Right now, it's mattresses, mattresses, mattresses ... plus. There is a green highway sign for W 24 that has been broken off and is down on the median of Caldecott Lane and the approach to the entry of 24 going west. The City of Oakland Public Works Agency has received this issue. It is registered as service request # 493567. Please check back for status updates or contact us directly at (510) 615-5566. City of Oakland Public Works Agency referred this issue to CALTRANS MAINTENANCE, service request # 493567. Please contact that agency to follow-up. For more information, please visit the "Helpful Links to Other Resource Partners" at the link below. As of 10:45 AM on 12/5/13 a silver 4-door sedan was illegally parked at the SE corner of the Henry J Kaiser Convention Center parking lot (just north of the construction trailers) and was completely blocking the only handicap access ramp to the new sidewalk along the Lake Merritt channel. Please ticket and or tow. This is just one example of frequent illegal parking that is currently taking place in this parking lot. Please install signs and curb striping to indicate no parking areas and enforce appropriately. Thank you. The City of Oakland Public Works Agency has received this issue. It is registered as service request # 493547. Please check back for status updates or contact us directly at (510) 615-5566. As of 3 PM car is gone. Thanks to PW if towed. You said issue fixed or closed. Well it's still here!! The City of Oakland Public Works Agency has received this issue. It is registered as service request # 493341. Please check back for status updates or contact us directly at (510) 615-5566. City of Oakland Public Works Agency referred this issue to CODE ENFORCEMENT, service request # 493341. Please contact that agency to follow-up. For more information, please visit the "Helpful Links to Other Resource Partners" at the link below. 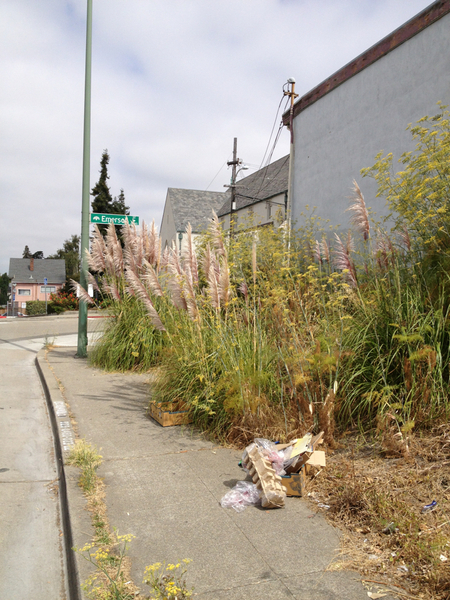 The strip of land on Chatham Road, adjacent to 3616 Emerson is overgrown with weeds and pampas grass. It needs to be cut at least twice a year. The City of Oakland Public Works Agency has received this issue. It is registered as service request # 472863. Please check back for status updates or contact us directly at (510) 615-5566. I found out that the City of Oakland only has a crew of 2 (two) vegetation management employee. They do a good job, but are overwhelmed by the work load. All the while, Mayor Quan and her cohorts are busy funding an expensive LED lighting project citywide that will be used in conjuction with a very expensive citywide camera system to view our lives. It is supposed to "deter crime". What cow dung! The vast majority of burglaries and armed robberies have been taking place in BROAD DAYLIGHT, many times with witnesses watching. With such poor leadership as this, is there any hope of a future for Oakland? Huge eyesore. Heavy vegetation and debris. The City of Oakland Public Works Agency has received this issue. It is registered as service request # 493575. Thank you, in advance, for your patience as we work through a backlog of pothole service requests. Unfortunately the City does not have enough funding to repave all streets in poor condition. With limited funding, our response to resurfacing requests is limited to minor pavement and pothole repairs only. Our Street Maintenance Department will assess your street and determine whether temporary measures might be appropriate. Please understand that this work may be limited to pothole or other minor repairs, and that we have many similar requests. We will do our best to respond in a timely manner. The backlog of streets in Oakland needing pavement currently is $435 million and growing.